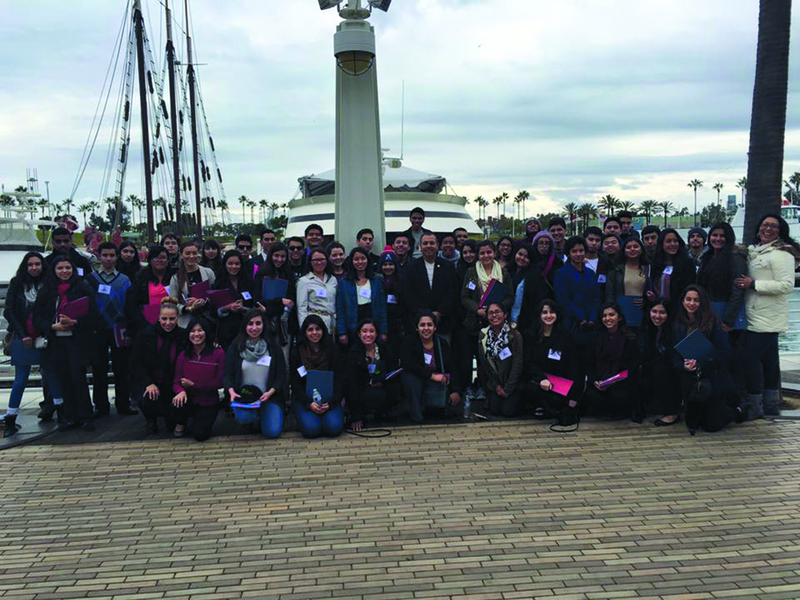 YSLP Students spend day learning touring the port of L.A. with the State Senator Tony Mendoza. In May 2015, Mendoza announced the launch of the 32nd Senate District Young Senators Leadership Program [YSLP]. The program was an extension of his previous course, Young Legislators, building on the program that was created when he served in the State Assembly from 2006-12. Each month of May recruiting begins and the program runs from August of the senior year to graduation. Mendoza was seeking applicants from local high school juniors and seniors who were interested in public service. Mendoza created the Young Legislators program to enrich the lives of young people by empowering them with the necessary tools to make a difference in their communities. Assemblywoman Cristina Garcia now heads her own Young Legislators Program for her district. This May marks the one year anniversary of YSLP, which provides high school seniors the opportunity to learn about California government and the legislative process and covering a variety of topics. Students participate in a range of activities including research of local issues and assisting constituents. The first year had 200 applicants, with 100 students beginning participation and 80 students actually fulfilling all the requirements. Mendoza expressly included the word ‘leadership’ in the name of the program, to stress that although the program would have moments of fun, it was not going to be a social club. He wants to emphasize that students are in the organization to learn how to be good leaders, even returning to university for his own leadership program. “I went back to school for two years, to learn how to be a good leader. It was an eye-opening experience,” says Mendoza,” even though I learned a lot in my 20 years of politics, the key thing to remember is that you must always be aware of how you conduct yourself and how your approach challenges. It expressly relates on how others perceive you.” Mendoza says the leadership program, taught him a lot about himself saying that in reflection, there many things that he should have done differently. After seniors complete the program there are internships that are available to students. Many former YSLP students return to mentor the incoming students. Selected high school seniors work from Mendoza’s district office, must commit to 40 hours of civic service, identify and address a community issue and travel to Sacramento to participate in a mock legislative session in the State Capitol. All applicants must be incoming high school seniors and have an interest in government and public service. Applications are available by calling Senator Mendoza’s office at (323) 890-2790 or at his website: sd32.senate.ca.gov/young-senators-leadership-program. To submit the YSLP application, mail it to Senator Mendoza’s district office at 400 N. Montebello Blvd., Suite 100 Montebello, CA 90640.